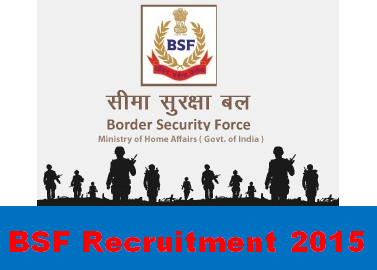 BSF Recruitment 2015 : 346 Constable (GD) Posts @ www.bsf.nic.in: Boarder Security Force (BSF) issued official notification for BSF 2015 Recruitment of 346 Constable (GD) on official website: http://www.bsf.nic.in (Recruitment of Sports Persons). There are total 346 vacancies of Constables (GD) (241 for male and 105 for female). We are putting further details as follows regarding the Recruitment. Candidates must pass 10th class from any recognized board/university. Sportsperson must be represented a State or the Country in National or International level comptition in any sports event. Candidates who are eligible for BSF Recruitment 2015 Constable they must take print of recruitment notification (as we giving below); fill the form. Attch the required documents and send to: Commandant, 25 Bn BSF, Chhawla Camp, Post Office-Najafgarh, New Delhi, Pin code-110071 within 30 days & for remote areas 45 days.